What should you pay attention to when implementing innovations? By using the empirical evidence collected through the use of advanced marketing research methods, Public Transport stakeholders can invest their funds in innovative concepts and solutions that can really favour Public Transport share, not wasting valuable sources for useless applications. This way, they can decide which innovations should be offered and how much they should charge. One key insight, derived from the Conjoint Analysis conducted in the frame of CIPTEC, is that introducing more than one innovation can have a significantly larger effect than introducing these innovations alone. While more evidence is necessary, this preliminary finding points to the fact that there is synergetic value (beyond mere adding of values) in combining certain innovations in a service. This finding also suggests that one-shot innovation introductions might be less impacteous in increasing choice share than a combination of two or more. However, according to our data, it should be noted that this effect does not appear to work for any combination – introducing the wrong innovations could result in marginal effects. Innovations should be strategically viewed, selected and rolled out in order to take advantage of the positive synergetic effects. What Public Transport stakeholders should pay attention to when they decide to introduce one or more innovations in their city’s Public Transport system? Investigate the implications that relate to the combined effect of the selected innovations on the increase in choice share with a parallel increase in current price ticket. The introduction of every single innovation, even with a 1%-4% increase in current ticket price, increases the choice share of Public Transport. Simulations also provided the conditions under which a larger increase in current ticket price would be accepted without a loss in Public Transport choice share (introduction of a specific number of innovations for a certain range of price increase). The introduction of combined sets of innovations has multiplier effects on the modal share of Public Transport, especially when these sets are relevant to the factors and the needs of the hidden groups. Use these results in combination with the estimated cost of each innovation in order to decide which innovations should be offered and how much they should charge. The introduction of the “wrong” innovations could result in marginal effects, so innovations should be strategically selected and rolled out in order to take advantage of the synergetic and multiplier effects. Challenge yourself to employ marketing research methods. Ideally, PTOs/PTAs should conduct a rolling Conjoint Analysis survey every 5 years or even more frequently in order to modify and diversify their services. Don’t do business as usual, think of social entrepreneurship! Public Transport has significant social impact and comprises a precondition for the overcoming of social isolation. How can a PTO/PTA organisation address key unmet social needs of the users’ and potential users’ of the Public Transport system? How can it tackle complex social challenges, such as climate change, lack of accessibility and transport poverty? The consideration and adoption of Social Innovation and Social Entrepreneurship concepts in the Public Transport sector can contribute in addressing effectively social and economic challenges! Although both concepts share the common high social impact and value they can produce, they are not identical. Apparently, a social innovation is not always provided by a social enterprise, while a social enterprise is not always offering innovative services. Social innovations are new products, services or models that meet social needs, create social relationships and form new collaborations. They introduce innovative ways and processes that tackle social challenges (European Commission a). A social enterprise is an operator in the social economy whose main objective is to have a social impact rather than make a profit for their owners or shareholders. It operates by providing goods and services for the market in an entrepreneurial and innovative fashion and uses its profits primarily to achieve social objectives. It is managed in an open and responsible manner and, in particular, involves employees, consumers and stakeholders affected by its commercial activities (European Commission b). For more information regarding the adoption of Social Innovation and Social Entrepreneurship concepts in the Public Transport sector, go through relevant CIPTEC Deliverables D6.1 and D6.2. Apart from the core activity of a PTO, that is the circulation of the Public Transport vehicles, there are plenty of other supplementary and supporting services that are (or could be) provided by external parties and entities enhancing the PTOs operation. These services can be produced by social enterprises and can be linked, whenever possible, with innovations of social purpose, being incorporated in the modern digital and social economy. A significant aspect of social entrepreneurship in Public Transport could be related to social change and travel behaviour change. Social entrepreneurship attempts to create wider changes in how the economic framework and system are formed. Influencing how people behave and think is of crucial importance, and may enable the re-branding of a business sector as a whole. In most cases, their services are complementary to the already existing ones provided by the PTO and cover some of the citizens’ unmet needs. Whenever potential services have no significant commercial interest but are of high social value, for instance when they target a niche or an underserved population group (e.g. people with disabilities, elderly, etc. ), social entrepreneurship business models might be the most suitable way of doing the work, as they tap into the potential of the whole spectrum of third-sector economy players. Don’t look at Social Enterprises as competitors! Seek ways to cooperate with them. Encourage their business by purchasing services from them or subcontracting to them part of your work. Establish a Social Corporate Responsibility strategy that includes the possibility of establishing partnerships with social enterprises, favouring their operation and expansion. The implementation of any innovation in Public Transport, which is characterised by various dynamic factors, requires an in-depth examination. 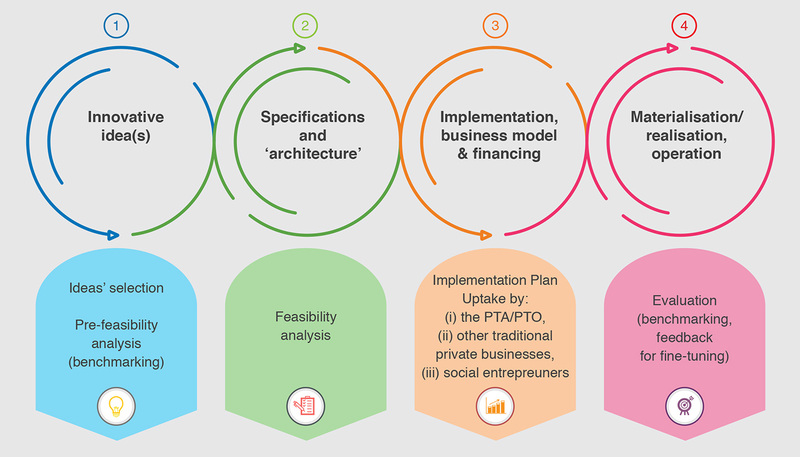 In order to increase the success potential of any new innovative solution (service or technological system), you can adopt a structured process by following certain design/planning steps, identifying and specifying/tailoring any possible innovative concept according to the local needs of your caseDesign & planning steps towards the implementation of an innovative concept. Pre-feasibility study: at this stage, you can identify the gaps between the current Public Transport supply and mobility demand and try to understanding which key areas should be addressed for improving service quality. Local needs, requirements and performance required for the new innovative concept should be mapped. A benchmarking exercise, namely comparing objectives set with the results encountered in other similar reference contexts, could be very helpful. Feasibility study: at this stage, realistic requirements and objectives can be set, detailed technical, functional and operational specifications can be provided, and long-term impacts on the interested stakeholders can be better understood. Implementation Plan: at this stage, you may consider all investment and operational costs, as well as the supporting actions needed. This stage can also be integrated with the feasibility study. Evaluation: you can measure and assess the success, results and impact of the realisation and operation, by using the indicators set in previous stages and considering other comparable experiences, e.g. in terms of context, institutional and technological/operational background, needs and objectives. poor involvement of the associated staff during the feasibility and design phase. Appropriate organisational structure and operational procedures can contribute to the smooth and successful implementation of an innovative concept in Public Transport. The revision of operational procedures can be integrated as part of the feasibility study for any innovative measure/solution. The role of the key responsible staff is very important, as it can effectively understand and predict the impacts of an innovation implementation, and propose new useful ideas. Thus, try to involve it actively in the design, contracting and evaluation phase of a new implementation. Provision of life-long learning opportunities will ensure you that the employees have the required expertise to address the challenges of any evolution. Behavioural change: bear in mind that customers/passengers tend to evaluate both reasons for and against engaging in the adoption of an innovation. Individuals may resist to innovation in different ways, such as by rejecting it directly, postponing it or opposing it. In addition to barriers raising from the users’ side, the employees’ resistance or the ‘lack of political will’ (i.e. commitment’ on the administration side) can also delay or undermine the implementation of an innovation. Regulation, fragmentation & resources: the Public Transport sector includes many ‘players’, and is widely affected by local regulations. The adoption of international standards is still limited and, overall, the resources allocated for research & innovation are lower than in other transport industries. These conditions slow down the speed of implementation of For example, the absence of an appropriate institutional framework for flexible (public) transport services may have prevented their expansion and, ultimately, their large-scale applications. Infrastructure: there are many challenges associated with the infrastructure. Nowadays, new materials, advanced ‘predictive’ maintenance and infrastructure of IoT can result in solutions that are able to tackle congestion in numerous cities. ‘Physical’ and ‘Virtual’ Integration of Public Transport (both of fixed and flexible services) with other mobility services, in particular ‘last mile services’, such as bike sharing, ridesharing, taxi sharing, etc., is a key objective in cities. Synergies with other business sectors could unambiguously boost innovation, as the knowledge and expertise derived from introducing and maintaining innovation in other sectors can be beneficially used for a more effective uptake of innovation in Public Transport. Schedule next steps, develop a strategy plan on innovation! Now you have reached the final step of the ‘Innovation Flow’. You are ready to organise the introduction, promotion and implementation of innovation in your city’s Public Transport system in a systematic way by developing an Innovation Strategy Plan. This plan will be adjusted to the peculiarities and needs of your area, taking into account the specific setting, the characteristics of the Public transport and mobility system, the level of innovation advancement of the area and organisation, the target groups, the organisation’s potential and resources, etc. The plan should be in line with your organisation’s available budget for introducing new innovations. The plan should follow a time frame with specific milestones based on your organisation’s target and objectives. Estimate how much human effort and resources you will need in order to reach the targets set. Prepare a well-balanced allocation of work and engage employees in the realisation of the plan. In case of limited funding sources, examine the possibility of using alternative business models, such as the concept of social entrepreneurship, to provide new, novel services to your customers. Identify possible risks, barriers or resistances you may encounter when promoting innovation. Be particularly aware of the human risks and resistances coming from the inside (e.g. from your staff) or from the outside (e.g. from the passenger base). Think of ways and means to manage, overcome or mitigate these resistances. Changing mindsets and making them more adaptable to a modern and ever-changing environment is far from being an easy process, but it is an investment that is worth your commitment, as it can produce tangible results. Innovating is the only way for you to go forward to the future. What could your Innovation Strategy Plan include? What are the innovative concepts and solutions coming from the CIPTEC Toolbox or your collective innovation activities that could address the plan’s objectives? Conclude on your selected innovative service, product, process, after having considered and assessed the suitability of the innovations under examination. For instance, you could define specific indicators against which you will determine the best solution(s) for your case, e.g. : (i) compliance with priority objectives; (ii) benchmarking of solutions; (iii) market limitations; (iv) first draft assessment of investment & operational costs; (v) time of implementation required; or (vi) any other aspect that is important for your case. Then, you could perform a simple multi-criteria rating exercise. The Feasibility Study should clearly identify the different implementation steps for the launch of the measure/solution in order to facilitate the monitoring and management of the implementation plan within time and budget constraints: (i) define the real objectives to be achieved; (ii) identify relevant actors and their responsibilities; (iii) define the specifications of the solution; (iv) evaluate the impacts of the solution on the organisation and operation; (v) define performance indicators and the expected value. How are you going to adapt your operational and organisational processes to effectively manage the innovation implementation? Define specific tasks, time frame and milestones (including pilots, if required); develop a Gantt chart; draft your Business Model Canvas; consider investment and operation cost impacts; consider the terms & conditions for the purchasing of the innovative service/system; identify possible co-financing sources. Identify potential risks and mitigation actions.